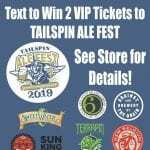 Stop By Cox’s to find a text code for your chance to win 2 VIP Tickets to Tailspin Ale Fest! Tailspin is the premier Craft Beer Festival in Kentucky and Cox’s is proud to be the Presenting Sponsor of the festival! PrevPrevious PostPappy Van Winkle Lottery! NextNext PostDare to Care Fundraiser!